Leading Manufacturer of walk in chambers from Thane. With our expertise in this domain, we are engaged in manufacturing and supplying a technically advanced range of Walk in Chambers. 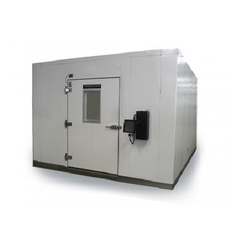 These chambers are manufactured under the supervision of experienced professionals, who strictly follow the established norms and standards of the industry. In addition to this, our professionals make sure to use quality tested material and modern machines while manufacturing. Also, our experts stringently examine these chambers on different parameter of quality and then forward for the final delivery to the customers. We also offer these chambers in customized range, in order to match the exact requirements of the patrons.